"Let slip the dogs of Wargame magazines"
I've always been fascinated with magazines that contain wargames. From the venerated S&T to the later pretenders and sister magazines. 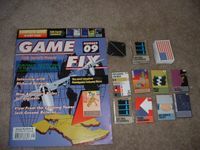 The magazines can live and die (which many have) by the reputation of their games. Once in a while one will slip through (get it?, ah, never mind) that will damage the reputation of the magazine and it will have to build back credibility with the subscribers. Here's a list of the absolute worst magazine games from each publication and just what made them so odorous. Ratings based on the BGG rating at the time of writing. Out of four issues published this is the lowest and probably most easily available still. This is the worst of the four game lot yet still garners some 8.0s and comparisons to the GCACW series. With games like these it's too bad it didn't continue publication. OK, not that many issues of Modern War have been published (only 8 to date) but in a multitude of high 6s and 7s the 5.5 stands out as substandard. Some complaints about rules errata and others didn't like the scenarios. Says a lot for a magazine now at 40 issues that the worst one weighs in at a reasonable 5.33. The initial implementation suffered from counter misprints and tables missing from the map. No better way to sink a ship in the Coral Sea or anywhere else for that matter. A mediocre game as the worst of the line? Not too bad. Arena of Death suffered from being a DragonQuest RPG tie-in so I don't know if people saw it as 'stand-alone' worthy. Ares only lasted for 16 issues with games and most broke new ground in Sci-fi and fantasy gaming. Arena of Death was just another reason to hack-and-slash monsters. Poor production quality and rules in need of much errata sank this. There was some interest in the game topic but it was overshadowed by the bad gameplay. Still, not as bad as some with the same problems. A horrible rules set prompted a second edition of the rules which improved the game. Unfortunately, the horse had already fled the barn and the gaming situation dealt with impending doom to begin with. The reason this wins out over Bloody Hunlikely (see later) is that this is an ISSUE game. The main attraction for selling the magazine. This had the distinction of being the first game of a new publication and yet still couldn't break the mediocre 5.0 barrier. It kind of foreshadowed things to come. The magazine struggled for several issues before giving in. Even though production quality was excellent for its time, the games consistently came in the 4-5 range. Some complaints that the counters were too big to fit the map and some complaints about the rules. Hard to find anyway. More of a paper simulation where the pieces were mandated to move and such in lockstep with the rules. Many thought it unplayable out of the magazine. Some tried to homecook the rules a bit to make it playable. Most agreed that it was unsalvageable. One of the most infamous magazine games out there. Warmaster Chess was being presented as a bonus game in three consecutive issues of Command. When the primary game for one of the issues did not make schedule, this was palmed off as the main game which drove subscribers crazy with fury. It didn't help that the editor got mad back and said so. It's a big part of the reason that Command went under even though other games in the magazine were quite good. It just couldn't recover from this fiasco. A recent addition to the Magazine Gaming Hall of Shame. It was much anticipated by the readership but a plethora (yes, it's a word, look it up) of map errors, counter errors and errata sunk it fast. I wonder if the ratings had a bit to do with the dashing of high expectations? Games around it are in the upper 6's and 7s so I think S&T will remain afloat. Among Nations was a Gamefix insert game. Not really sure why it is rated so low. It seems like it would make a passing fair game for a Soc. or Econ. class. Imagine football in slow motion. OK, now make it slower, no, slower than that. Slow to the point where peoples voices sound like pops and cracks. Now you have the pace of this game, a hex and counter version of American Football. It would take a half hour to play through one play. A whole game was one series of downs. Plus the horror of this being presented in a WARGAME magazine didn't win it many converts. "Where's my tanks!" A second game in Conflict #7. 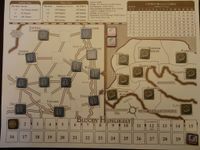 The Alamo was more akin to a worker placement game than a wargame. Arrange your survivors on the wall where they again get blasted by Santa Ana. Rinse. Repeat. Yawn. Against the Odd's lowest rated game but since it was a bonus game it only gets a dishonorable mention. Accused of being a random dicefest with little to decide, there was also a devastating typo where forces were divided by 10 instead of 100 giving one side an overwhelming edge. Why is this here? It has a respectable 5.94 rating! When first published in S&T 191 the thing was totally unplayable. Errata wouldn't cover all the errors made in this rush to production. The topic was good and popular but if you can't play it what good is it. It actually prompted S&T to rewrite the rules and publish them and some corrected counters in S&T 194. All of the favorable ratings are on the 2nd edition ruleset.